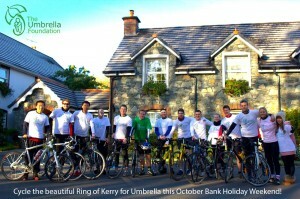 For the 2nd year running The Umbrella Foundation are hosting a fundraising cycle around the Ring of Kerry this October Bank Holiday. A huge success last year this event promises to reward you dearly for your fundraising efforts. Only change is we will have two groups of cyclists – one will complete the 170kms over two days and the other over just one day to cater for all levels. Group 1 leaves Killarney Sat morning (Oct 26th) and going clockwise will arrive back in Killarney that night. This group can choose to spend two or more nights in Killarney and welcome back Group 2 on Sunday evening. Group 2 leave Killarney just after Group 1. They will spend the Saturday night in B&B’s in Waterville and with a shorter day’s cycle will arrive back to Killarney late Sunday afternoon. Accommodation and support will be arranged similar to last year. Anyone wishing to complete only a small section or just take a break is more than welcome to jump into one of the support cars. All the money raised here goes directly to the kids in Nepal and the on-going operation of the childcare homes the reintegration, youth programmes and rural community work under ‘The Umbrella Foundation’. PLEASE spread the word and pencil in the date on your calendar!